Book the comedian that works with you to make your event a success. You need a corporate comedian who’s genuinely funny and different. The material needs to be personalized for your unique audience. The content must be clean and professional. You need a host who will turn the show into an experience. The comedian must truly entertain and impress the crowd. You need a corporate comedian who will break up the monotony of a technical event. Ready to add fun and laughs to your next event? See customized comedy that makes people laugh. We’ll create your customized comedy plan. Put on the most memorable event that your people will never stop talking about. Former engineer turned comedian, Don gets laughs everywhere he goes. 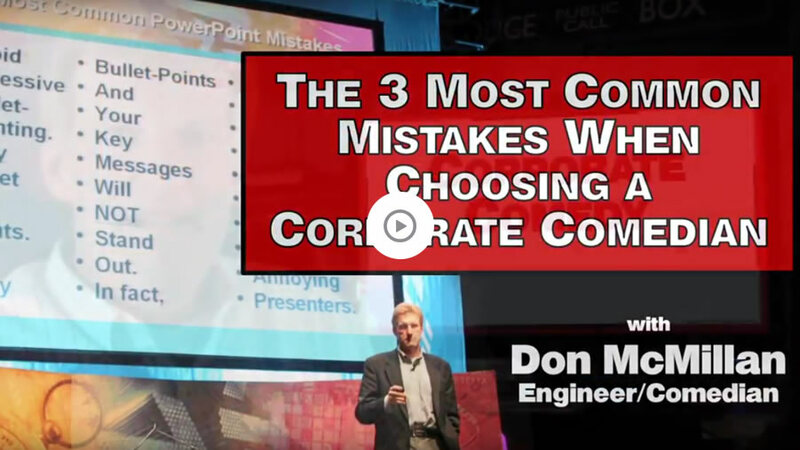 Don’s corporate show utilizes his unique background to take a lighthearted look at business-life, technology, and everyday life – suitable for any audience. Customizing every appearance, Don works closely with each client to prepare a unique comedy show. Performing over 500 shows for major corporations, including Microsoft, Apple, IBM, Google, ExxonMobil, and Genentech, organizations, nonprofits and event planners trust Don to deliver the ultimate comedy relief at what are often dry workshops, conferences or events. Don graduated Lehigh University with a B.S. in Electrical Engineering and Stanford University with a Master’s Degree in Electrical Engineering. He worked for AT&T Bell Laboratories (as part of the team that designed the world’s first 32-bit Microprocessor) and then as a computer chip designer at VLSI Technology, where he designed more than 20 Standard and ASIC Designs (many of which are still out there today). After winning the 16th Annual San Francisco International Stand-Up Comedy Competition in 1991, Don turned in his chips for a microphone. He went on to be $100,000 Grand Champion on Star Search in 1993. He’s had numerous television appearances including The Tonight Show, The Larry King Show, MTV’s Half Hour Comedy Hour, and A&E’s Evening at the Improv. Nowadays, you can catch Don headlining top comedy clubs across the country including the Improv, Comedy and Magic Club, and Ice House. You most likely have seen Don as the star of 15 national commercials for Budweiser Beer. He plays Bud delivery guy who mans the “freshness hotline” and protects the world against “skunky” beer. He can also be seen in commercials for 7–11, Franco-American Ravioli, Little Caesar’s Pizza, ServiStar Hardware, and United Airlines. Don has starred in Don: Plain & Tall an independent film that was awarded Best Feature: Comedy at the Back East Film Festival and the Breckenridge Film Festival. He has also been profiled in both Entertainment Weekly, TV Guide, and the IEEE Spectrum. Currently, Don has two YouTube hits, Life After Death by PowerPoint and Live from My Cubicle, viewed by more than 2 million people, and his brand Technically Funny has over 30,000 subscribers. I wanted to personally thank you for your participation at the summit. You added that sparkle of laughter that everyone needed after being bombarded by PowerPoint charts. Thank you for your willingness to work with us and we look forward to working with you at the next event! I received absolutely terrific feedback from everyone. Don gave a superb performance. The context of his show gave many of us had the opportunity to laugh at ourselves and really connect with the team. We want to thank you again for an outstanding and very entertaining evening this past week. We heard nothing but great comments from the attendees for the rest of the week. Your presentation and delivery really hit the mark and resonated with all of us in the audience. This was one of the highlights for the event and helped to make this one of our most successful C3 events to-date. You were the highlight of the event. Thanks for making this event a success! Ready to book the corporate comedian that works with you to make your event unforgettable?